It’s the end of the year and circumstances have me sticking close to home — despite reports of rare birds in the area I’d like to see: a Glaucous Gull at Whiffen Spit Sooke, a Clay-colored Sparrow at Martindale, a Mountain Bluebird at Saanichton Spit. If they can hang in until next week, well, I’d appreciate the gesture. We’ll see. Nice to think back on the past twelve months and some great birds, including the Least Grebes I saw in Texas, the Sauble Beach Piping Plovers, and the Point Pelee Blackburnian Warblers, to name a few. For those of us how count species seen (and I’m one), the ‘board’ resets on January 1st and the count starts anew. The Glaucous Gull at Whiffen Spit is at the top of my New Year list! In a way, this story is about misplaced assumptions. And being wrong – again. Remembering that Snowy Plovers nest (in season) near Grayland, Washington. I make a quick decision, take an access road to the beach and hope for the best. I don’t expect much, especially since pickups and jeeps are everywhere on the sand. I’m not planning on spending more than a half hour here anyway but it breaks up the long drive I’m on. I walk down the last half mile down the road. A jeep passes me at speed, tears down to the tideline, does a couple of spectacular water fountaining donuts and then leaves. Now, I think, there’s no way I’ll see any of the tiny plovers. The jeep will have freaked them. Wrong. The Plovers appear. And they’re thrilled. They’re in and out of the vehicle tracks, scooting from furrow to furrow, like so many tawny mice. I can only guess why. Perhaps, the jeep tires have turned up tasty little critters, or maybe the ruts are just good to hide in. I find the vehicles irritating but, to the birds, I guess they’re like big ruminants, herds of elk maybe. And perhaps they take advantage of them in the same way egrets and other birds do in Africa when they tag along with elephants. Minus the bird advantages of elephant droppings, of course. A few male Hooded Mergansers have arrived at the little bay near my home and the forecast is for rain, sure signs that summer is indeed over. Soon, the wet weather will set in. I make a last warm weather trip to Swan Lake, a local hot spot. The lake is glass smooth and flecked with, I think, fluff from Cottonwood trees. Four young Pied-billed grebes are feeding at the limit of my camera’s usable range. Plus they won’t keep still. Cute little guys but very active, diving every five seconds or so. It’s like a fairground ‘bash a mole’ game; they never reappear in the same place twice. I’m hoping to add a Sora, a swamp-dwelling rail, to my year list. I know one (at least) inhabits the dense stand of bulrush at the west end but I’ve tried for this secretive bird umpteen times and it keeps eluding me. I shouldn’t take it personally. On my last visit a week or so ago, a pair of young otters popped up through the duckweed, lifted their anvil heads to scan the shoreline and then, snakelike, slid out of the water and into the cattails. Slick, deadly and quiet. Human beings aren’t the only predators the Sora is alert to. I give up on the bird the on my first pass and carry on to the meadow. I hear birds in the trees but the foliage is so dense I don’t see much so I decide to have one more try at the Sora. A Blue Heron though sets up for a nice shot. The Herons are so commonplace that it’s nice to spend some time examining them–such a handsome bird. I take some shots and, for some reason, I turn thinking the Sora might be near. And it is! Ten feet away and watching me. I have to pivot quietly to get a picture, which on a floating bridge isn’t easy but the bird seems relaxed, picking its way along the water’s edge. And then, like magic, it’s gone. I always feel grateful when a bird shows up like this. I may have said so in an earlier post. It’s like a favour and I appreciate the gesture. Thank you, Sora! Visibility decreases as I walk and sound takes on a new quality, suppressed unless the source is close; then it’s enhanced. A foghorn sounds from somewhere, the familiar basso profundo moan and close by the soft sibilant call of Savannah Sparrows, clear and bright in the damp air. One hops up on a fence post and then vanishes like a magician’s bird from a hat. A pretty bird with its pale mustard eyebrow. Even the commonest structures look different today – a tumbledown lean-to, for example. I passed this wreck dozens of times but, today, I observe it and take in details I haven’t noticed before. Sherlock Holmes tried to teach Watson about this power. ‘You see Watson, but you do not observe‘, he says, when Watson can’t tell him how many stairs he walks up every day at 221B Baker. I think it’s in A Scandal in Bohemia. Birding is great for observing, by the way. Attention to detail is what makes it all work. And likewise, the row of shells in a tide channel on the beach. The quality of light and the elimination of visual distraction helps me see this commonplace differently–beach debris now transformed into a string of precious jewels, or a garden. Usually, I’d just crunch on through. Today, I step around it so as not to disturb this most ephemeral of art pieces. A small squadron of Western Sandpipers hums past somewhere off to my left, chattering –jeet, jeet. Invisible. I never do see the Willet or the Upland Sandpiper. Likely they were just passing through anyway but I could easily have walked by them. And a hundred other birds, for all I know. I do see a large dark shape in a dead tree. I think eagle but it turns out to be a despondent-looking Turkey Vulture, waiting for the sun and some nice juicy thermals to lift him up into a blue late summer sky. Just wondering – do you have room in that car for me? Author cran621Posted on May 20, 2015 May 20, 2015 Categories UncategorizedTags Big-Year, bird art, bird humor, bird lists, bird photography. 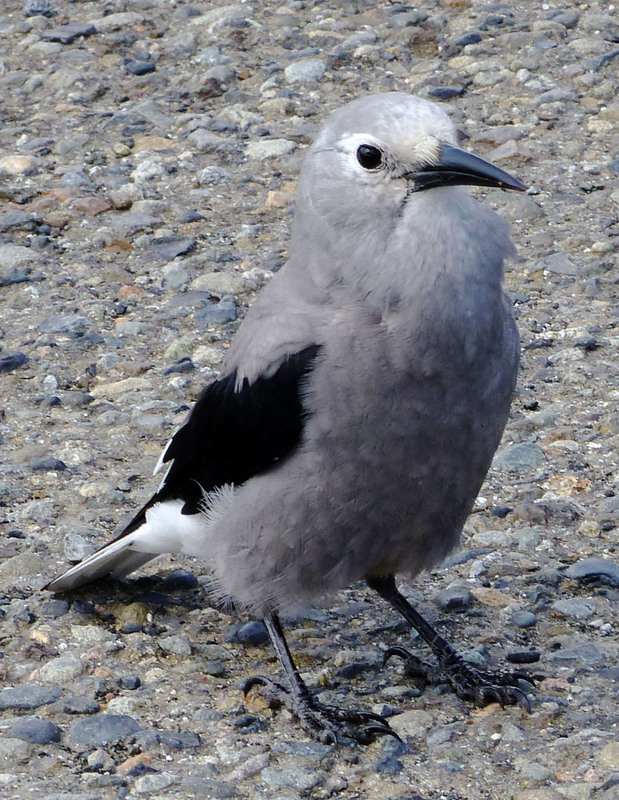 digital photograhy, birding, birding travel, birds, Clark's Nutcracker, funny birds, Mountain birdsLeave a comment on Just wondering – do you have room in that car for me?